The territory of Dorgali and Cala Gonone is characterized by the wide variety of Archaeological sites and historical evidences. At the end of the 19th century, Domenico Lovisato was the first to analize and study some Domus de Janas located in the countryside. In 1911 Ettore Pais discovered the Tiscali Village, located on the countryside nearby the towns of Dorgali and Oliena. In 1930s Antonio Taramelli published the first archaeological map of the area and in 1936 Doro Levi discovered the village of Serra Orrios, the largest sardinian nuragic complex. It is made by more than 200 elements and could hosted about one thousand people. 15 Dolmen, megalithic thombs located mostly in the northern part of the island,three Menhirs and the hig-reliefs of Sa Icu dating back to Late Neolithic adn Eneolithic (3800-2000 BC). The anthropomorphic figures carved in the Bue Marino caves are dated back to the same Era. 193 sites, among which we can count 78 villages, 46 nuraghi, 40 tombs of giants, 17 wells and three walls, constitutes a unique testimony of the Nuragic age. The Domus de Janas Conca and Janas are sepulchral structures consisting of prehistoric rock tombs typical of the prenuragic Sardinia. They are located in the Conca and Janas area, near Dorgali, and constitute a three tombs necropoli. The domus of Janas Mariughia is located about one kilometer north of Dorgali, on the western side of the so-called "Sa Bobboa" rock. 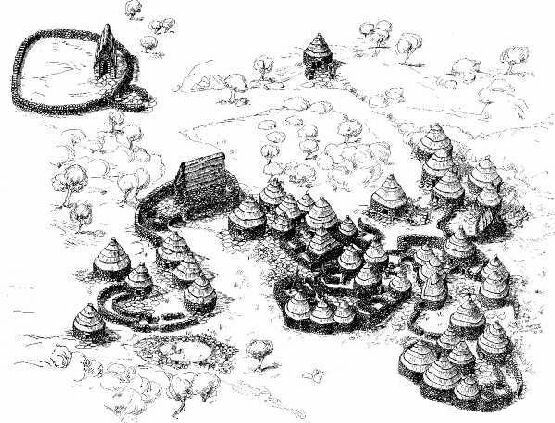 A single-cell type ipogeo, it has the floor plan and a curvilinear vault. The Domus de Janas Isportana is a prehistoric burial consisting on a typical prenuragic Sardinian rock-cut tomb.It is situated in Isportana, on the outskirts of Dorgali. The Domus de Janas Pirischè, also known as "Sa Domu de Su Re", is a typical underground tomb located in the area called Pirischè. The Dolmen Motorra is made of an horizontal large slab of basalt set over seven smaller stones that form a polygonal base. Around them is a stone circles that was to be the containment of the earth that formed the mound coverage. The construction of the Dolmen Motorra goes back to the third millennium BC. Dolmen Monte Longu ("long mountain") is a prehistoric tomb about three kilometers from the municipality of Dorgali. It is located on the southern slopes of Mount Bardia a short distance from the rock of Monte Longo 513 m above sea level, overlooking the wide valley that faces the touristic center of Cala Gonone in the Gulf of Orosei. Monte Longu it is one of the best preserved dolmen of the territory of Dorgali. is located on the mountain over the beautiful beach of Cala Fuili. The importance of this site is especially due to the nuragic village Nuragheddu which is one of the largest in Sardinia and is composed of more than 200 huts of various shapes and sizes.On the site, in the inner face of the wall, we find a residential environment and a notched stele of a giant tomb. The stele, finely worked, was reused in Roman era and documents the presence of a safe burial structure nuragica type rows isodomic structure, which has not yet been taken over the position. Is a well preserved nuraghe with tholos located in the Orgosolo territory. A well preserved nuragic structure with tholos in Sa Giuntura, Orgosolo. It has a complex structure with a vast settlement and well. It is located in Biristeddi not far from the town's giant tombs. it is a basalt complex structure made by with squared blocks, arranged in regular horizontal rows, that make the upper blocks seem to fall into the centerline of the lower ones. The fortress was probably formed by three towers enclosing a small courtyard entrance to the South West. It is located 500 meters from the Nuragic village of Serra Orrios, in the territory of Dorgali. The nuraghe Gulunie is located near the beach of Osalla, in a panoramic position overlooking the sea. Archaeologists say its function was to spot boats coming from the sea. The structure consists of basalt square blocks. Access to the inside is prevented by the material collapsed from the top. The nuraghe dominates the view from the top of the flat and the Barony of much of the territory of Dorgali. Ia few kilometers away from the town of Dorgali, it dated back to the second millennium BC and consists of a Nuragic settlement with more than 100 huts, two temples megaron and a meeting hut. It was discovered between 1936 and 1938 by Doro Levi. Later in 1961 the site was restored under the direction of William Maetzke and it now stands as one of the best preserved Nuragic settlements in Sardinia. Located a few kilometers from the town of Dorgali, it consists of several still intact huts, a holy well and a dolmen. is one of the largest coastal settlements in Sardinia. It 'a big settlement comprising 130 huts located near the town of Cala Gonone. Is one of the largest in Sardinia and is composed of more than 200 huts of various shapes and sizes; it was continuously occupied for a very long time, throughout the Roman times up to the Imperial Age. Located in the municipality of Dorgali, is a post nuragic village placed inside a sinkhole, probably populated up until the Romans age. It is still possible to see the foundations of the huts and a portion of the wall of one single hut. The Tomb of the Giants Sa ena and Thomes is a dolmen type, dated back to the Bronze Age and is in excellent condition. It retained much of the corridor funeral coverage with lintels, that is made up of stone slabs arranged horizontally along the walls corridor. The large stele consists of a monolith-trailer, which is dug in the small access door to the burial chamber. The exedra still have some stones stuck as they were originally. The tomb of the giants Biristeddi presents a particular construction technique: it is built with perfectly squared trachyte blocks. Unfortunately. today it is not in good conditions. The burial chamber is made up of blocks molded as a shoe in the side walls. The exedra still some blocks placed as before and a block of trachyte with dentil frieze, which was probably placed on the entrance to the tomb. Is a dolmen type thomb from the Bronze Age and is in fairly good condition. It retained much of the corridor funeral coverage with lintels, made up of stone slabs arranged horizontally along the corridor walls. The large stele consists of a monolith-trailer, which is dug in the small access door to the burial chamber. The exedra still have some stones stuck as they were originally. located on the basalt edge overlooking the Cedrino 1.2 km east of the provincial road 38, they are attributed to the Chalcolithic. They consist of 57 geometric shapes, involving an area of 10 x 12 m, mostly carved in high relieftecnique (only one engraving) on 3 blocks of basalt that rise on average 30 cm on the ground surface. The artifacts depict: simple rectangular, truncated three-levels pyramids or simple rectangular with semi-circle that appears on the larger side of the rectangular base.